That snuck up on us quickly, didn’t it? (My kids would argue that it’s taken forever to get here. Ah, youth.) The boys have already thrown themselves headlong into the summer rhythm of fishing, biking, climbing trees, catching snakes, dabbling toes in brooks and lakes, snacking, and swinging in hammocks. *The salesmen are adorable, tis true, but so are their garden sculptures. When we get home Saturday afternoon, we are invariably tired to the last man (or wo-man, as the case may be. That’s Woah-Man!) and hungry. We haul in the goodies we purchased from fellow vendors, stash the veggies in appropriate storage containers and collectively collapse on chairs. And then the, “I’m hungry!” chorus starts in earnest. If I haven’t thought ahead this is the moment that makes me regret that acutely. The very best solution is having something in the freezer to take the edge off of the heat. 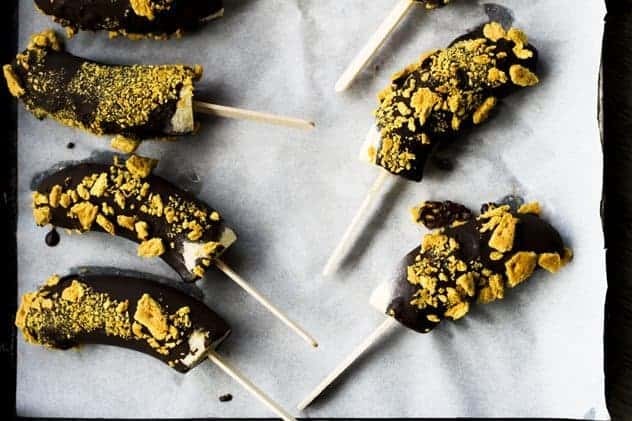 These frozen treats -Chocolate Covered Banana Pops- or CCBPs, as the kids call them, are a steadfast favourite around here. The frozen bananas taste for all the world like vanilla ice cream pops coated in chocolate! My mom used to make them for me and my siblings when we were little (even though she hated bananas personally) and I’m carrying on the tradition. I keep it up in part because it’s a fabulously healthy snack that feels indulgent but also because I still love eating them myself. …There is one more reason, though, and it’s a doozy. The chocolate dip for the frozen bananas makes a killer Magic Shell topping for other frozen treats. Didya freeze some strawberries? Throw a few in a bowl and drizzle a little reheated Homemade Magic Shell over the top. Bowls of ice cream cry out for a little tap-tap-tap-break chocolate shell on top. Ice cream cones never looked so good as when they’re dunked into melted chocolate and uprighted to form that little curlicue at the top. So freeze a few bananas today. Make a double batch of the Magic Shell. Boldly dunk frozen things (or drizzle the melted Magic Shell over the aforementioned chilled goodies.) and remember what it’s like to be a kid in the summer time. This is truly a kid-tested, mother-approved recipe. If you wake up some sweltering morning, you could eat something far worse for breakfast than a CCBP. Not that I’ve done that. Today. There just isn't anything more reminiscent of childhood summers for me than frozen Chocolate Dipped Banana Pops. The frozen bananas taste just like ice cream pops! Kids of all ages love these.Make a double batch of the dip to use as a healthy (and divine) Homemade Magic Shell. Put the chocolate chunks into a microwave safe jar. A wide-mouthed pint jar works perfectly for this project. Microwave on high for 1 minute. Remove the jar from the microwave, add the coconut oil and stir until smooth. Use immediately or add a tight fitting lid and let cool to room temperature before refrigerating for up to 1 month. Remove lid from the jar and reheat on medium power in 30 second increments, stirring well after each burst, until smooth and thin. Pour and/or dunk as needed! Line a baking sheet with parchment or waxed paper. Cut the bananas in half and insert a wooden popsicle stick about 2-3 inches into the cut end of each banana half, leaving enough stick outside of the banana to grip easily. Arrange the bananas so they are not touching on the baking sheet and put it, uncovered, into the freezer. Freeze until the bananas are solid all the way through. If you want to have additional toppings to roll onto the chocolate with the bananas, pour them into pie plates or small dessert plates. Heat your Homemade Magic Shell coating until thin. Remove the tray from the freezer and quickly dunk each banana -1 at a time- into the Homemade Magic Shell, let the excess drip from the banana and quickly roll it into any additional toppings you're using. Return the dipped banana to the spot on the tray where it was before, and repeat with the remaining bananas. When they are all dipped, you can eat them right away or transfer them to a rigid container with waxed paper or parchment between layers. Cover the container with a tight fitting lid and keep frozen up to 1 month. Great minds think alike! I already have four bananas on sticks in the freezer ready for their magic shell topping! This is awesome! I freeze bananas all the time for smoothies and banana “ice cream” but have yet to even think about putting whole ones on a stick. Brilliant! If you have a craving for a delicious chocolate dessert, just try this recipe. It is so delicious! I thought the frozen bananas would be odd to eat but it was really good. I used milk and semisweet chocolate. 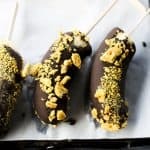 I make frozen banana pops but coating them in chocolate is a thing that I am yet to try. They look awesome. Do the bananas not get soggy as they unthaw? You serve them frozen, so they don’t get the chance to thaw! Store the coated bananas in the freezer for best results!